Hydrogen is required in refining processes in order to produce low and ultra-low sulfur fuels. Hydrogen sources can be external or internal, of course. External sources are generally nearby third party industrial gas providers, who supply pure hydrogen streams, often in exchange of fuel gas (FG) or natural gas (NG) for either or both feed and fuel. In some cases, impure hydrogen can also be provided by external sources, which can be purified in the refinery in the Pressure Swing Absorption (PSA) units, producing FG as a by-product. External hydrogen purchases are governed by contracts, which can be very complex, including such considerations as take or pay clauses and penalties in the event minimum or maximum quota requirements for purchase are not met. Many refineries operate internal high purity hydrogen production units, generally based on gas reforming, using either NG or FG as feedstock. Gas reforming processes are endothermic, requiring FG for heating the reactors, and use steam as diluent of the feed and power to drive the feed charge and product compressors, either electric or steam driven. The SMRs produce steam and FG as byproducts. When FG is used as a feedstock, a critical decision must be made about the best use of sources of the FG streams within the refinery units. When NG is used as a feedstock, many times it is considered to be a petrochemical feedstock rather than a fuel, having an incremental cost that could depend on its final use. For example, a site may operate a cogeneration unit, including gas turbines, and the NG could have a tax credit resulting in a lower incremental cost that NG purchased for other uses. In the case of a cogen, the electric power production becomes an integral part of the economics affecting operational decisions. Frequently, refineries will also have sources of low purity hydrogen that can be either purified at PSAs or used directly in the process, being mixed with high purity hydrogen streams. The processing units that use hydrogen need to maintain a certain Hydrogen-to-Oil Ratio (HOR) in order to provide the proper amount of hydrogen to drive the process (i.e., hydrotreaters and hydrocrackers). These units produce relatively rich hydrogen streams that need to be purged into the FG system, but their purge rates need to be carefully calculated in order to avoid excess purging. If the high purity hydrogen streams sent to the FG system are at a relatively higher rate than typical, the impact on the FG lower heating value (LHV) could be very noticeable, impacting boiler and fired heater burner capacity (i.e., they will need to burn a higher volume of gas in order to provide the process the required duty, possibly reaching a constraint due to capacity limits). In many refineries both external and internal hydrogen sources, either pure or impure, are available and can be used together. As explained previously, any decision to import or internally produce hydrogen will impact not only the hydrogen system purity and availability, but the FG system in addition, affecting the volumes of any externally purchased or internally supplied reposition fuels (like NG or LPG). Any attempt to reduce the costs from the utility side (i.e., to optimize the energy system) should be based on accurate utility system models including steam, fuel, and power and calibrated with validated and consistent set of measurements. In order to consider the interaction of the hydrogen with the fuel system, a compositional model of the fuel must be included in the model. Solving and optimizing the energy and hydrogen balances at the same time is key to ensuring consistency with operations and constraints handling. 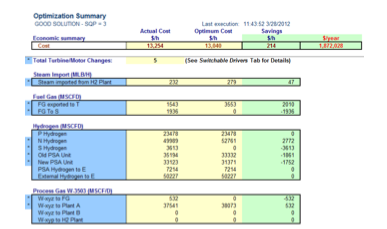 The optimization's goal should be to reduce the overall utilities cost. In order to do this accurately, the model must take into account constraints associated with the existing equipment combined with the pricing for steam, fuels, power, hydrogen. Detailed models for contracts for the purchase and/or supply of utilities are essential to calculating accurate incremental pricing in the optimization. To add even more complexity, the economic optimization should be also consider the emission limits as constraints or as part of the objective function (i.e. cost or credit of the CO2 emission if above or below a certain quota). The energy management system models needs to be executed and optimized at a scheduled frequency with online, real time data in order to provide operations personnel with continuously updated recommendations. In addition to the optimization, Key Performance Indicators (KPIs) should also be calculated and stored in the Site Plant Information System or DCSs for Operations and Management use. Validation of the meters used by the energy management system to calculate KPIs ensures the accuracy of KPI history. The following describes how an integrated model optimizing the utilities and their interaction hydrogen system has been implemented in a real industrial environment. The main project steps are explained and critical details to be taken into account to assure successful use and proper technology transfer to the client are discussed. It also presents real industrial examples are presented in which the cost of the site-wide utilities of a production site (i.e., steam, fuels, boiler feed water, hydrogen and electricity) is optimized with a real-time, online software system that is well-established in the refining and petrochemical industry. Refineries and petrochemical plants usually operate large and complex utilities and energy systems. They typically burn multiple fuels, operate cogeneration units to supplement the electric power purchases or export electricity, need to provide steam at several pressure levels to serve different types of consumers, have several sources and consumers of hydrogen and need to observe emission limits. In almost all of the cases, these complex utilities and energy systems have a number of degrees of freedom. Proper manipulation of the degrees of freedom with the aid of cost-based optimization software can result in significant operating cost savings. Power industry deregulation provides new challenges to operations in the minimization of cost, as the price for electricity can change several times each hour. Electricity price represents one of the main economic trade-offs with the hydrogen, steam, and site emissions limits. Other important aspects to consider are that utilities systems continuously evolve (changes are frequent) and that sometimes, there is a lack of sensors and no chance to reconcile data because redundancy is almost nonexistent. Therefore, measurement errors need to be addressed properly. Also, it is important to mention that traditionally, depicting the high economical potential and perhaps because of the complexity of the integrated systems, the optimization of the utilities was traditionally managed at the level of each individual sub-system, Plant or Area. But the optimization of each individual Area does not necessarily give the true overall site optimum. 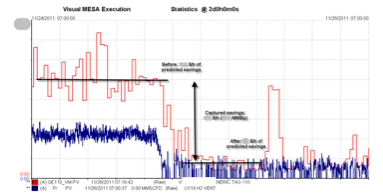 Moreover, an attempt to optimize a whole site based on an isolated view of each Plant or sub-system at a time could be worse than not attempting any optimization. In the dynamic operational and economical environment of a Plant, implementing the proper actions necessary to reach the optimum overall utilities system management can only be done with the aid of an on-line tool. Such a system should execute in an unattended, automated way, providing the correct recommendations at all times to the different users, whether they be operators or engineers, with the man-machine interface appropriate for each one of them. To add more complexity to the problem, the environmental constraints are becoming more and more complex and stringent. With all the regulations already on place and those coming on the horizon, emissions will become a significant factor in operations and planning, adding new operational constraints, increasing the operating cost, involving potential needs of capital investment and adding an opportunity to generate value from trading. In the path to compliance, organizations are facing several challenges in establishing an effective procedure to deal with the emissions on a consistent, optimum cost basis. And to add even more burden to the problem, control rooms worldwide are facing a shortage of people. Operators are concentrating more and more on the Units under his or her responsibility. DCS screens have flourished, with hundreds or even thousands of tags being available for each Unit and with a multitude of process diagrams and trends being projected on walls and even ceilings. With only a few employees available to take care of the interaction between energy system operations and economics, having a rigorous model to optimize the energy system is becoming important. Industrial energy systems are becoming increasingly complex and inter-related, not only connecting Units of the same Site but also with the hydrogen, power and utilities systems of neighboring facilities. 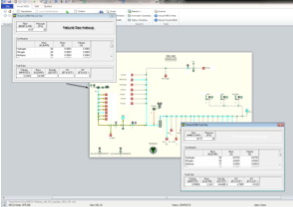 The evolution from having decentralized plant information scattered throughout many islands of automation to a unified and centralized Plant Information System was a clear enabling layer for site-wide energy system models. DCSs (Distributed Control Systems (DCS) and Plant information (PI) systems are the most widely available data sources in the current industrial context. PI systems usually acquire data from the DCSs and store it in a unique repository. The long term, facility-wide PI system-based historians constitute what is known as an enabling technology, because they are the cornerstone on top of which decision support systems, such as energy management systems, can be built. Centralized real-time databases provide access to massive current and historical process, laboratory and financial data. In order to successfully address all the issues mentioned above, a software tool called Visual MESA has been used extensively. The original MESA program was developed in the early 1980's. Since the Visual MESA version was released in 1997 with a graphical user interface, has been continuously improved and adapted to be able to cope with all these changing scenarios. 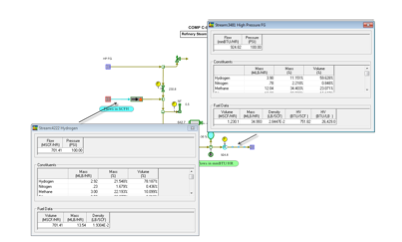 Visual MESA is a computer program designed to model steam, boiler feed water (BFW), condensate, fuel, emissions, hydrogen and electrical systems. It is an on-line program that receives live plant data from the steam, fuel, condensate, BFW, and electrical system metering devices via a standard link to real-time data from the plant information system. It typically works automatically retrieving on-line data from the process using the OPC standard connectivity (ref. 1), continuously evaluating the utility and energy system optimization alternatives and writing key performance indicators back to the plant information system. 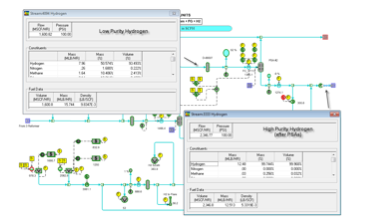 The software includes the necessary features to calculate and properly handle the hydrogen sub-system and its interaction with the rest of the utilities and including emissions. 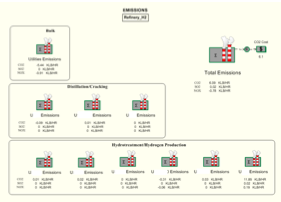 This is accomplished through a compositional representation of the hydrogen and fuels streams, combustion properties to calculate boilers and heaters efficiencies, open calculation blocks to accommodate ad-hoc equations and correlations, andemission source stoichiometric calculations or estimations based on correlations for individual process point sources (i.e., FCC catalyst Carbon emitted from the regenerator). Understand how to operate at the optimum steam/fuels/electrical/hydrogen system operation, including emission constraints and costs. Quick reaction to minimize the economic impact of an operational change affecting the energy system. Optimize the overall cost of fuel for steam generation and electricity, including the choice of the most cost effective combination of turbines and motors. Make good use of the utilities network data availability and improve the data quality. Auditing & Accounting: Assistance for plant personnel in finding where steam waste is occurring in the utility system, providing information to account for utility use properly and identifying where the imbalances are occurring and how they may change over time. This on-line energy management system has been implemented at 60+ sites worldwide to model and optimize in real time the overall site energy and utilities systems for a variety of industries: petrochemical, refining, chemical, sugar & alcohol, district heating and cooling, combined heat and power, etc. Several of them have been published (Refs. 2 to 16 are related to recent industrial projects). Amongst them, two particular examples that were not published previously will be presented and discussed. Note: Due to the confidentiality, the information and screen captures have been modified. This first industrial example corresponds to a Gulf Coast refinery in the U.S. The real- time optimization software has been in operation since 2007. The overall optimization of steam, fuel gas, hydrogen and power allowed a reduction in overall operating costs, helping the site to work close to the optimum on a consistent basis since their start up. The client has calculated the savings achieved at the site due to Visual MESA's optimization to be in excess of $4 million per year. 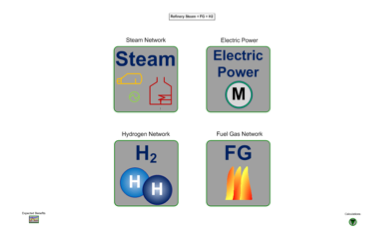 The following figures show a few details of the hydrogen and FG networks interconnection, where the impact of the hydrogen sourcing decision can be seen. As a result of the manual changes in the hydrogen and steam sources plus the turbine and motor swaps, the FG header pressure control system made the necessary adjustments which resulted in the need to reduce the NG makeup, resulting in significant savings. The following figure shows the fuel gas network model representation. On the top left, NG and Propane suppliers are represented, and on the bottom FG consumers are displayed. This second industrial example corresponds to a west coast US refinery. The real-time optimization software has been in operation since 2011. The hydrogen network representation includes the modeling and optimization of the in-house production (at two SMRs), the external pure hydrogen purchase, the hydrogen vent and the Hydrocracker purge optimization. The effects of the hydrogen production on steam and fuel gas consumption/production are taken into account by assuming a linear relationship with respect to the current use/production for both Units. The main steam headers diagram of the site is shown in Fig. 7. The two internal hydrogen production plants are also shown. Energy cost reductions have been obtained taking advantage of the real time energy management system software functionalities including all the site sub-systems. In the following figure, the schematic of the FG system is shown. 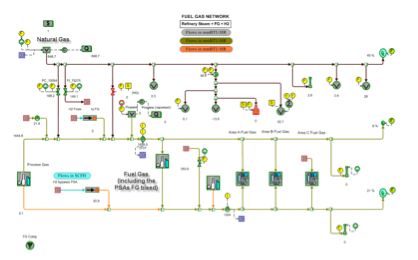 The NG makeup mix with the process off gas streams into the mix drum, from which the FG is distributed to all the users of the site (Fig. 9). The NG as well as some process off gas streams can be used as feed to the SMRs also. Therefore, the tradeoff between hydrogen production and FG use was modeled and optimized along with the rest of the sub-systems. Total calculated savings and other results from the Optimization are saved to history in the plant information system. In Fig. 10 a trend demonstrates of the predicted savings captured as the optimization variables, including the one shown, is properly adjusted by the operator. Energy cost reductions have been obtained taking advantage of energy management system software functionalities including together all the site sub-systems, including the important interaction of hydrogen systems. Such reductions can only be achieved through the use of a robust optimizer that is very well suited to be used on-line and providing optimization recommendations to the operators on a routine basis. The authors, working closely with clients and Soteica engineering team members, have participated in many successful implementations which resulted in significant economic benefits for the refining and petrochemical industries involved, oftentimes topping $2MM+ per year in documented savings. The success of the industrial real time project deployments has been enabled by following a set of simple rules and ensuring a proper knowledge transfer to both the client Operations and Engineering personnel. Coordination among plant areas in order to implement the proposed optimization recommendations, as well as management involvement to ensure the initiative's success, are both critical issues. The quality of the recommendations from the tool helps Operators to gain confidence in the overall optimization system. Application sustainability, which includes both maintenance and support from Soteica, is critical to continuing capture of the economic benefits after commissioning. This helps ensure the model stays "evergreen" and bringing value to the owner for many years after commissioning of the project.